We Measured Trump’s First Year According To His Own Goals. Here’s What We Found. Well, it’s been a year — how is President Trump doing? Last spring, we picked seven measures that would allow us to gauge Trump’s success or failure in office according to his own goals. Now, as Trump prepares to deliver the State of the Union address on Tuesday, we take a look at where the country is headed and compare that with the direction Trump wanted it to take. For the sake of this exercise, we weren’t interested in whether Trump’s actions directly caused any of the changes we saw in the metrics. We cared only about outcomes, not what produced them. 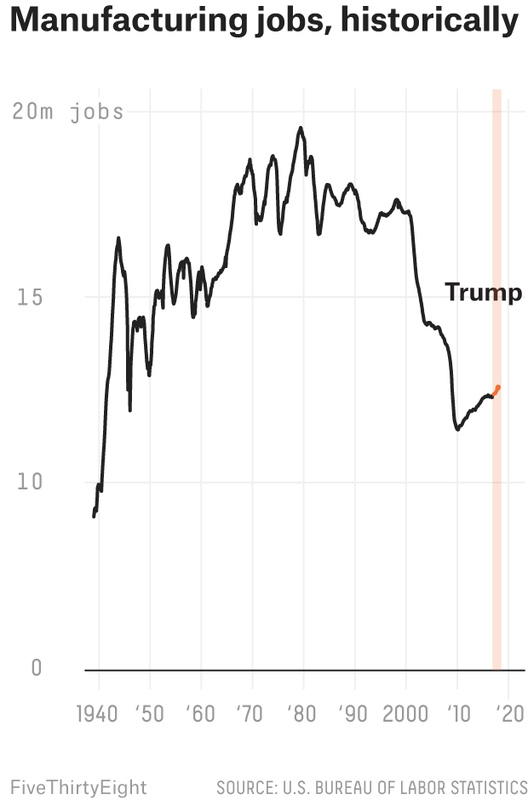 The story of Trump’s presidency so far: Some things are going his way, but many results, both good and bad, are a continuation of trends that began well before Trump took office. 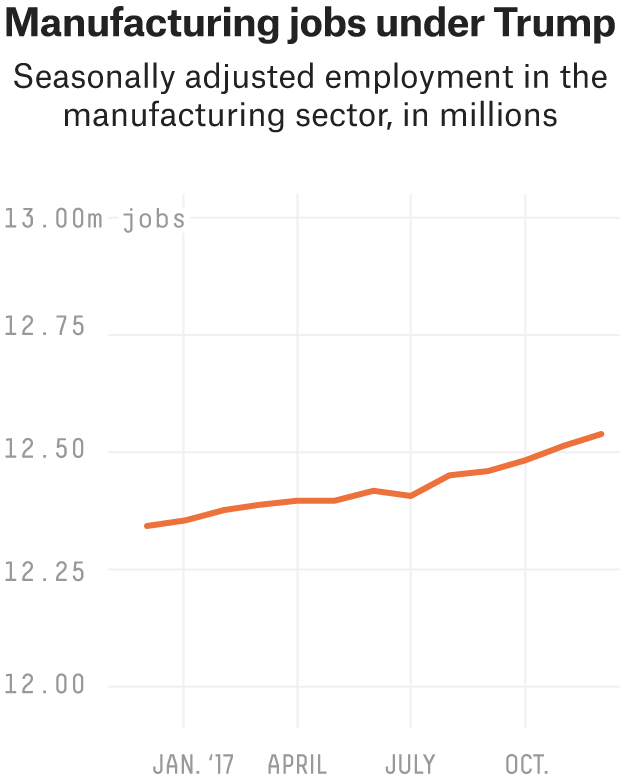 The U.S. added 184,000 manufacturing jobs in 2017. That’s an increase of 1.5 percent over 11 months, which is slightly larger than the average annual increase1 since 2010 (1.1 percent), the first full year after the recession officially ended in 2009. 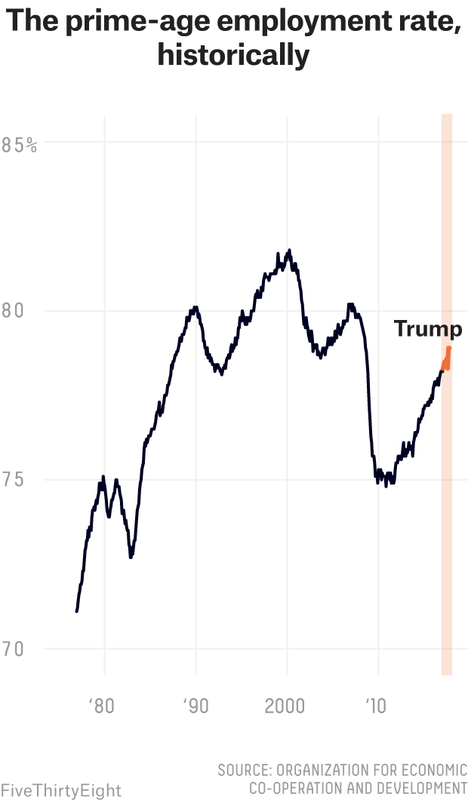 Overall, the country now has 12.5 million manufacturing jobs, which is more than at any point since 2009 but still well below the levels we saw before the recession and in past decades. 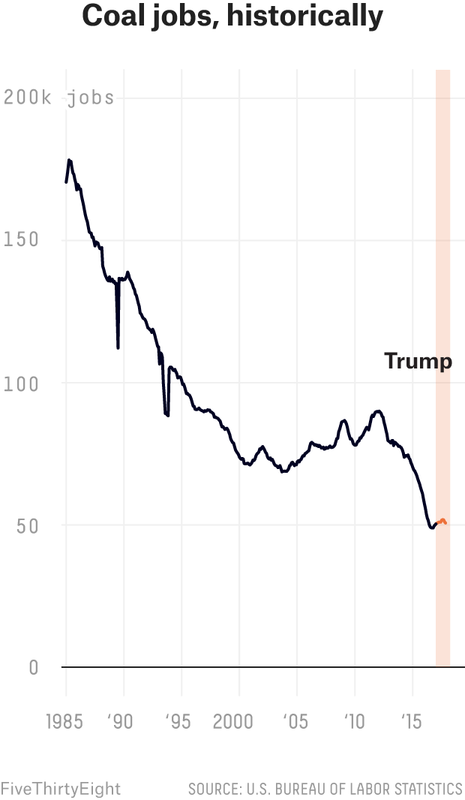 Coal jobs increased from January through the fall of Trump’s first year, but then dipped back down, meaning just 500 more people were working in coal mines at the end of December than had been in January. 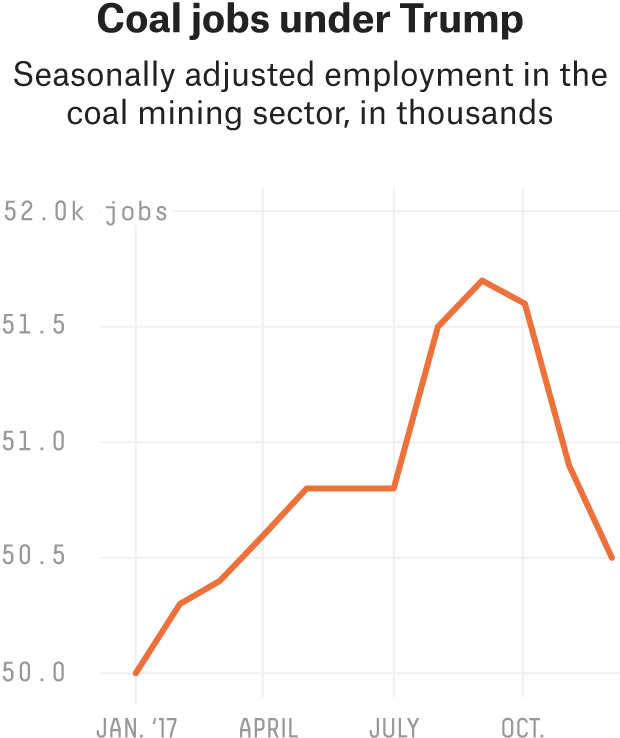 This increase continued a brief trend that began about a month before the election — the number of coal jobs dropped through most of 2016, bottoming out in September and then growing slightly through the end of the year. 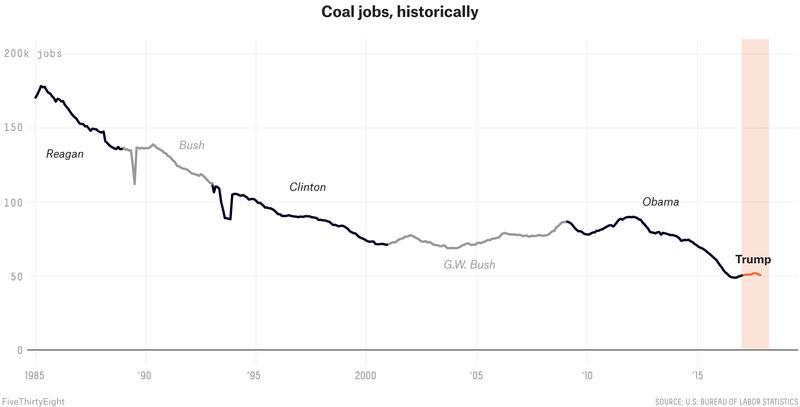 Still, the country doesn’t have nearly the number of coal jobs it once did — the number of people working in that industry has shrunk by more than a third since the end of the recession. The deficit was essentially unchanged in 2017, according to our measure. 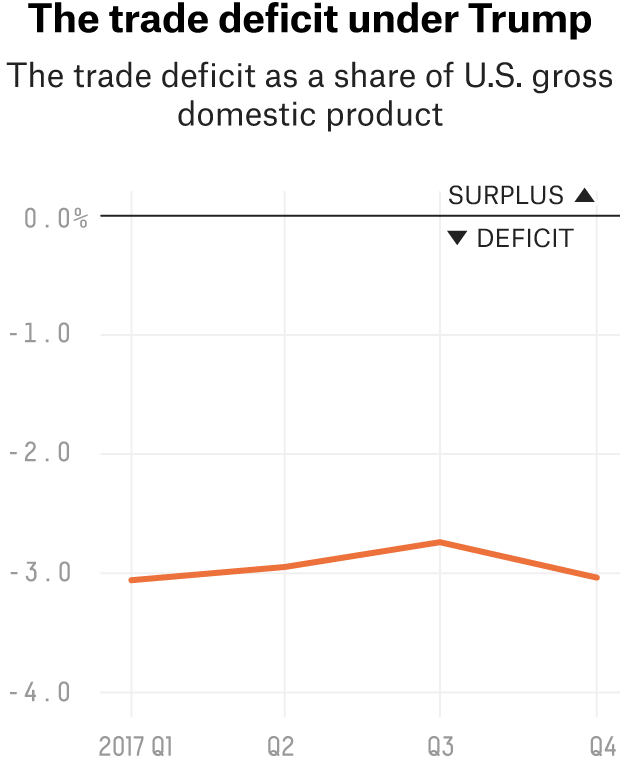 We checked the size of the deficit (nominal exports minus nominal imports, at a seasonally adjusted annual rate) as a percentage of the gross domestic product, and that number shrank very slightly from 3.06 percent of the GDP to 3.04 percent last year. 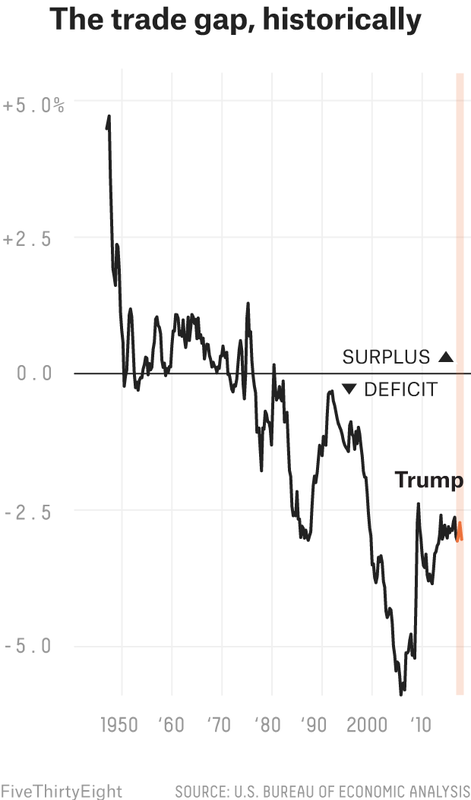 During Obama’s two terms, the deficit varied from 2.4 percent of the GDP at its narrowest to 3.8 at its widest, averaging 3.1 percent over the full eight years. 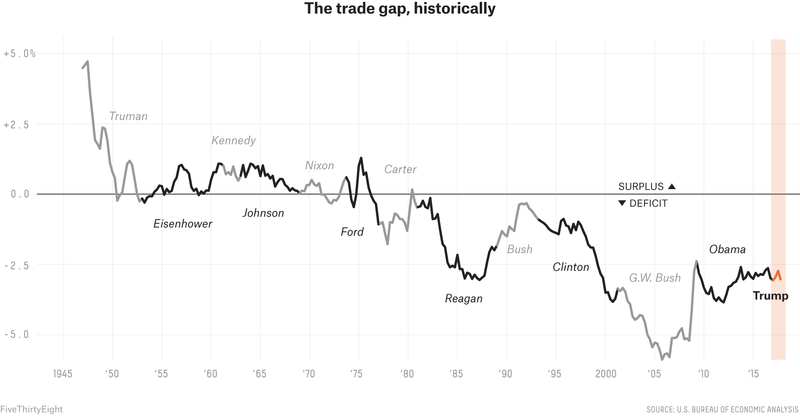 The U.S. has continuously run a trade deficit since the ’80s, and Trump hasn’t had much effect on it yet. The percentage of people aged 25-54 who had jobs increased from 78.2 percent to 78.9 percent — a rise of 0.7 percentage points — between Jan. 1 and Oct. 31, 2017. 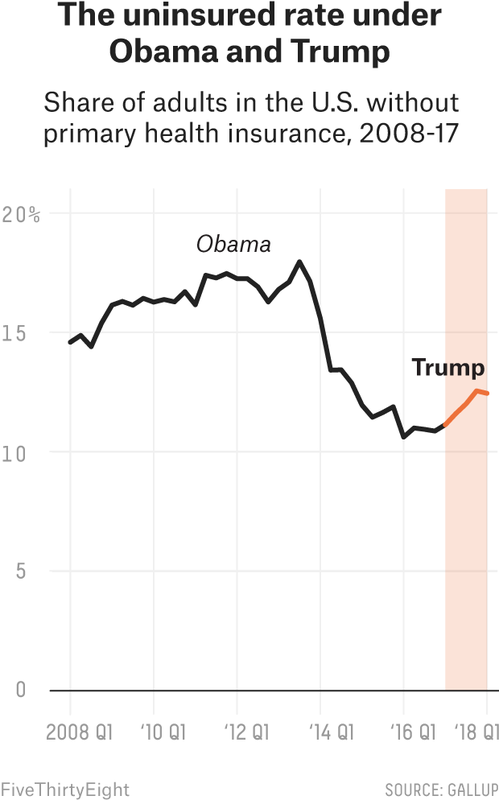 Between 2010, the first full year after the recession, and the end of the Obama administration, it increased an average of 0.4 percentage points per year. 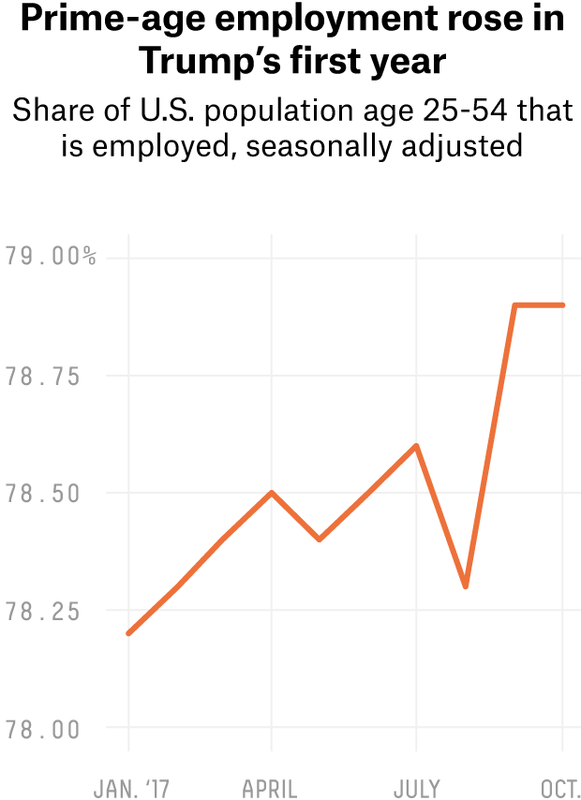 The prime-age employment rate is now approaching pre-recession levels: In November of 2007, the last month before the official start of the recession, 79.9 percent of 25-to-54-year-olds were employed. The FBI has yet to release the full crime statistics for 2017, so we turned to FiveThirtyEight contributor Jeff Asher, who keeps data on murder for U.S. cities with a population of more than 250,000. Although multiple efforts by Republicans to get rid of Obamacare failed, Congress did vote to repeal one of the law’s key provisions via last December’s tax bill: the individual mandate, which requires most people to have health insurance or pay a fine. The repeal doesn’t take effect until 2019, however, so it’ll take a few years before we can see how that change affects this metric. 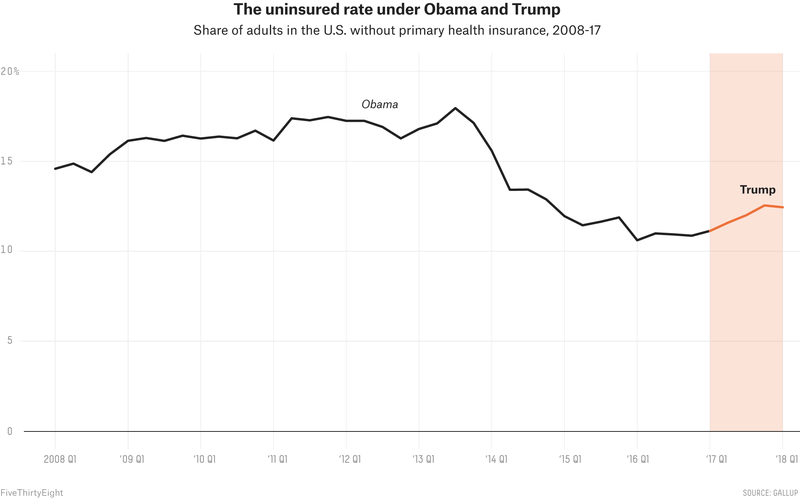 Even without the mandate repeal, insurance coverage went down under Trump. According to Gallup, between the fourth quarter of 2016 and the fourth quarter of 2017, the share of uninsured Americans increased by 1.3 percentage points, from 10.9 percent to 12.2 percent. 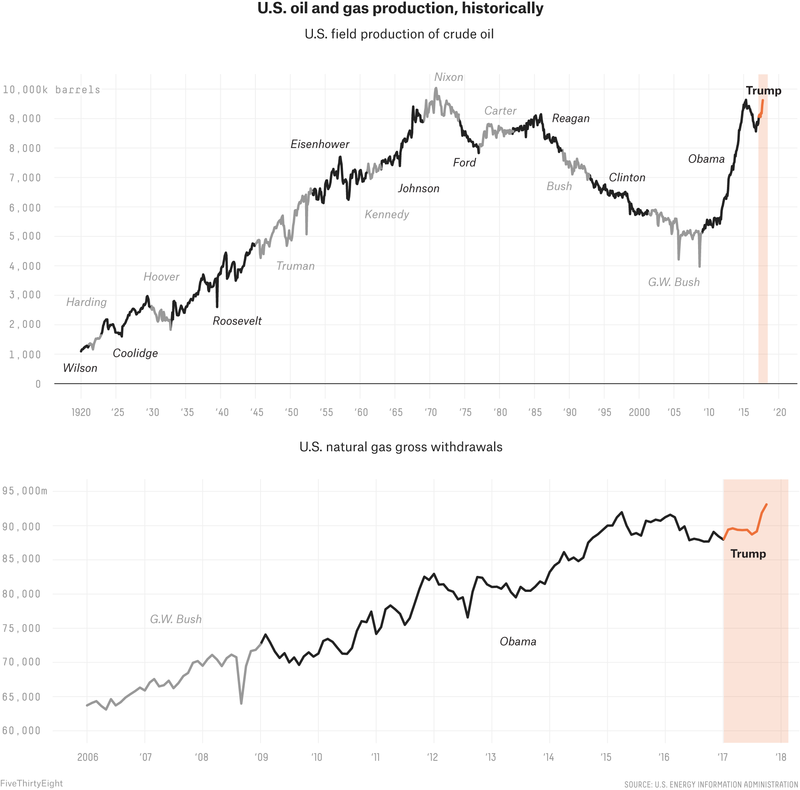 By October of 2017, the U.S. was producing 812,000 more barrels of oil per day than it was in January, an increase of 9.2 percent.4 U.S. natural gas production, meanwhile, was 5.1 billion cubic feet per day higher in October than in January, an increase of 5.8 percent. The annual average growth rate of oil production during the Obama administration was 7.3 percent. By comparison, natural gas production grew at an average of 2.5 percent annually during Obama’s time in office. All average annual changes were calculated using the year-over-year changes from January of each year. Keep in mind that the national numbers may be different because big-city murder trends tend to overstate national murder trends. Note that this doesn’t take into account changes in the underlying population of the cities. We’ll have to wait until more recent numbers come out to assess the full year.